(CNN) When Albany, New York, patrolman Gregory McGee went to work last Sunday morning, he got the unpleasant news that hackers had rendered many of the internet-connected tools he relied on for work inoperable. “We were crippled, essentially, for a whole day,” McGee, who’s vice president of the Albany Police Department’s union, told CNN. “All of our incident reports, all of our crime reports, that’s all digitized,” McGee said, which meant cops had to write down everything that happened on paper. They showed up to work and had no access to staff schedules. The culprit was the City of Albany getting infected last Saturday with ransomware, in which malicious software spreads across a network, rendering computers inaccessible, encrypting their files and demanding a fee to go away. The city had recently taken over management of most of the police department’s networks. City Hall itself experienced a number of municipal service interruptions, too. Albany residents were told to go elsewhere to get birth certificates, death certificates or marriage licenses. Some residents complain that building and development applications haven’t been available via the city’s website, Councilwoman Judy Doesschate told CNN. Ransomware fundamentally works as an extortion scheme, encrypting computers and demanding an extortion fee to unlock them. In recent years it has become one of the most prominent problems in cybersecurity. It’s often deployed by criminal hackers simply seeking money, though the US has said the two most infamous strains, WannaCry and NotPetya, were authored by the North Korean and Russian governments, respectively. That the ransomware hit on a Saturday is likely no coincidence, said Kelly Shortridge, the vice president of strategy at Capsule8, a New York cybersecurity company. Albany declined to share additional details, including what type of ransomware it’s facing and whether it’s hired a third-party company to mitigate the problem, but a spokesperson for the New York State Office of Information Technology Services told CNN it is assisting. There’s no indication yet who may have deployed the attack, and there are a number of active groups that use ransomware to extort funds. There is precedent for the US accusing individuals of infecting cities with ransomware, however. In November, the US Department of Justice charged two Iranian men with a campaign of targeted ransomware attacks whose more than 200 victims included hospitals, municipalities and public institutions, including the cities of Atlanta and Newark, New Jersey. Things started to get better after the beginning of the week. On Monday afternoon, police were able to digitally file incident reports again. A spokesperson for the Albany Police Department said the department “has remained adequately staffed since the attack and there was never an interruption in police services to our community,” but declined further comment. By Tuesday, the city was able to process marriage licenses again. Birth and death certificates, however, are still unavailable from City Hall. As of the first week of the attack, at least 17 people from Albany had contacted the State Department of Health instead for birth or death certificates. And the police department’s scheduling program was still unusable. McGee, scheduled to teach a safety class Friday, didn’t know who he would be teaching. Doesschate, the councilwoman, told CNN that while the ransomware has been an inconvenience for constituents who haven’t been able to access certain information online, it was relative. Phishing attempts more than doubled in 2018, as bad actors sought to trick victims into handing over their credentials. They used both old tricks – such as scams tied to current events – as well as other stealthy, fresher tactics. 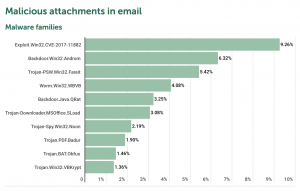 Researchers with Kaspersky Lab said in a Tuesday report that during the course of 2018, they detected phishing redirection attempts 482.5 million times – up from the 246.2 million attempts detected in 2017. In total, 18.32 percent of users were attacked, researchers said. Bad actors continued to rely on an age-old trick in 2018 for phishing attacks: Using newsworthy events, such as new smartphone launches, sales seasons, tax deadlines, and the EU General Data Protection Regulation (GDPR) to hook the victim. Phishing emails purporting to be about GDPR, for instance, boomed in the first few months of 2018, because during those months there was an upturn in legitimate GDPR mailings warning users of the transition to the new policies, which require stringent processes to store and process personal data of European citizens. Attackers unsurprisingly took advantage of this with their own GDPR-related emails: “It was generally B2B spam — mostly invitations to paid seminars, webinars, and workshops promising to explain the ins and outs of the new regulation and its ramifications for business,” said researchers. Other top events, such as the 2018 FIFA World Cup and the launch of the new iPhone sparked phishing attempts, including emails leading to fake FIFA partner websites for the former, and spam messages purporting to sell accessories and replica gadgets for the latter. Despite the cryptocurrency market’s struggle in 2018, bad actors’ interest in cryptocurrencies appears far from waning. In fact, scammers utilized a number of methods to capitalize on victims’ interests in the cryptocurrency market, such as posing as a cryptocurrency exchange or fake Initial Coin Offering (ICO) bent on convincing victims into transferring money to cryptocurrency wallets. When it came to ICOs, scammers extended invitations to victims for investing in various ICOs via email and social-media posts. One such scam targeted a cryptocurrency called buzcoin; the scammers got ahold of the project mailing list and sent fake presale invitations to subscribers before the ICO began – eventually making away with $15,000, according to Kaspersky Lab. There were also sextortion scams that coerced victims to send cryptocurrency in exchange for keeping quiet about their private online activities, with one campaign in July noted for using victims’ legitimate password in the email as a scare tactic; and another one in December hit victims with ransomware. In 2018, the number of malicious messages in spam was 1.2 times less than in 2017, according to researchers. 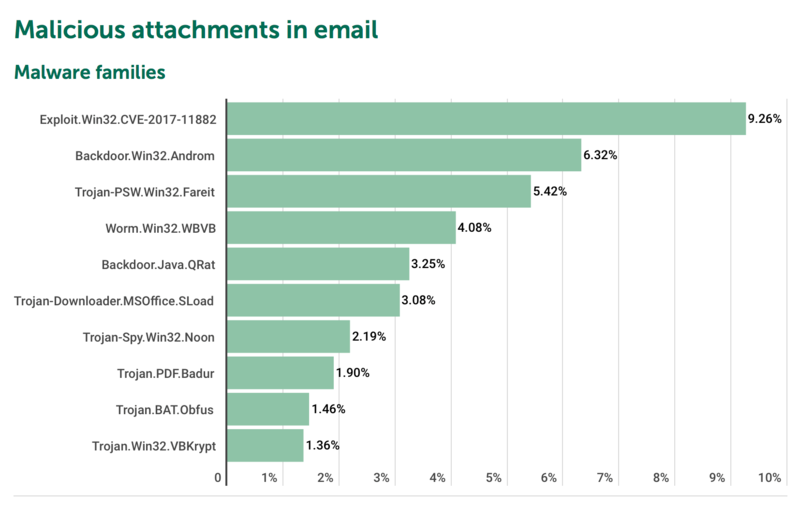 Of those malicious messages, the most widely distributed malicious objects in email (Exploit.Win32, CVE-2017-11882), exploited a patched Microsoft vulnerability that allowed the attacker to perform arbitrary code-execution. Despite this downturn in malicious emails, scammers appear to be looking to other sneaky tactics to avoid detection and still make off with victims’ credentials — in particular using non-typical formats for spam like ISO, IQY, PIF and PUB attachments. In addition, bad actors appeared to transition to new channels of content distribution beyond email – including social media sites, services like Spotify, or even Google Translate. Originally seen: March 7th, 2019 by Nicholas Thompson of Wired. Opening a cute cat meme or innocent landscape photo may seem harmless enough, but if it happens to be in a .PNG format, your Android device could be critically compromised due to a new attack. In Google’s Android security update for February, the tech giant’s advisory noted a critical vulnerability which exists in the Android operating system’s framework. All it takes to trigger the bug is for attackers to send a crafted, malicious Portable Network Graphic (.PNG) file to a victim’s device. Should the user open the file, the exploit is triggered. Android versions 7.0 to 9.0 are impacted. The vulnerability was one of three bugs impacting Android Framework — CVE-2019-1986, CVE-2019-1987, and CVE-2019-1988 — and is the most severe security issue in the February update. There are no current reports of the vulnerability being exploited in the wild. However, given the ease in which the bug can be exploited, users should accept incoming updates to their Android builds as soon as possible. Google’s bulletin also outlined remote code execution flaws impacting the Android library, system files, and Nvidia components. Elevation of privilege and information disclosure security holes have also been resolved. Source code patches for the .PNG issue, alongside other security problems raised in the bulletin, have also been released to the Android Open Source Project (AOSP) repository. In January, researchers revealed the existence of a new malvertising group called VeryMal. The scammers specifically target Apple users and bury malicious code in digital images using steganography techniques to redirect users from legitimate websites to malicious domains controlled by the attackers. This entry was posted in Uncategorized and tagged android, computer, hacking, internet, mobile, phone, phones, photo, photo hack, security, tech, technology. We often hear about sextortion, business email compromise (BEC), and inheritance scams, but the often overlooked “Romance Scams” could be the most insidious of them all. Not only do victims lose money, but the emotional entanglement ultimately leads to heartbreak. Romance scams are months long, if not year long, campaigns where bad actors catfish, or pretend to be in love with, an unsuspecting victim in order to steal money from them. They do this by creating fake romantic relationships that the victims become invested in and are willing to help them with fake financial troubles. In a report shared with BleepingComputer, the Agari Cyber Intelligence Division (ACID) outlines how a criminal gang out of Nigeria called “Scarlet Widow” targets those who are more likely to be lonely such as farmers, elderly, the disabled, and divorced. This catfishing is done through the creation of fake personas that utilize stolen pictures of attractive people, fake names, personalities, and back stories where they were victimized in the past, but still believe that love is possible. They then create accounts on social media and dating sites, including ones that may attract those looking for love or are lonely such as Dating4Disabled.com, Farmers Dating Site, and DivorcedPeopleMeet.com. For example, one of the fake personas discovered by Agari is a person named “U.S. Army Captain Michael” who is serving a tour of duty overseas, but is looking for love after he lost his wife. 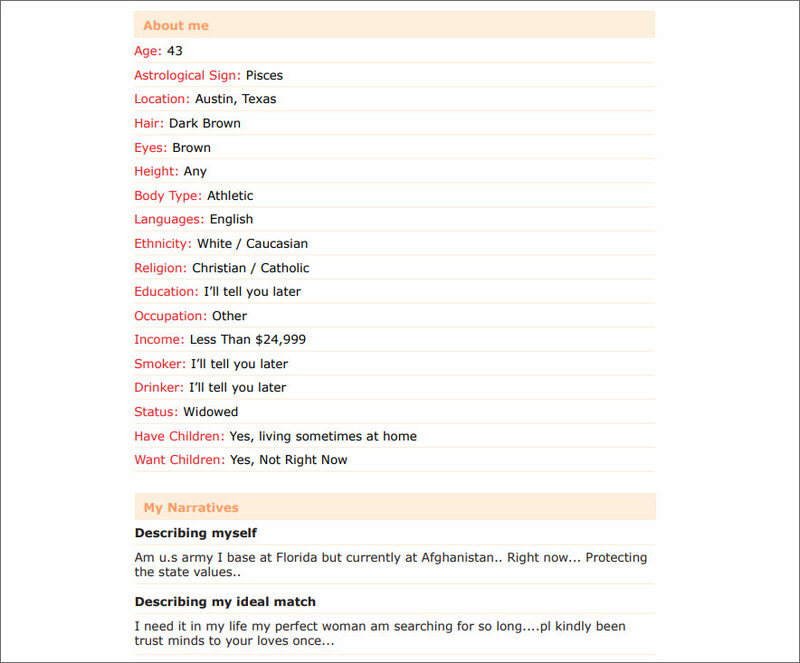 The fake persona for Captain Michael was posted to dating sites such as MilitaryCupid.com and MarriedDateLink.com during a 6 month period in 2017. Agari states that each of the personas created by Scarlet Widow have different personalities and ways of communicating that reflect their backstory and who they are targeting. For example, the researchers state that Captain Michael’s messages are usually short and to the point, while the gang’s female personas have a “softer, inquisitive, and more verbose tone”. Ultimately, though, these scams are not about making true romance, but about stealing as much money from the victims as they can. Once a “relationship” is established, the scammers tell their victims that they are having financial difficulty and need financial assistance. This assistance is usually in the form of money for plane tickets, travel assistance, or accommodations. If the victim is shown to be willing to send money, then the scammers continue with their relationship while continuing to siphon money over a long period of time. Such is the case with Texan man who was going through a painful divorce and met one of the gang’s fictitious characters named “Laura Cahill”. Over a period of one year, the Scarlet Widow persona was able to scam the individual out of $50,000. This person was so firmly hooked that when the scammers didn’t reply to him in over a week, he sent a distraught email to her pleading for a reply. It ultimately got so bad, that this individual stole $10,000 from his father to send to the scammers. 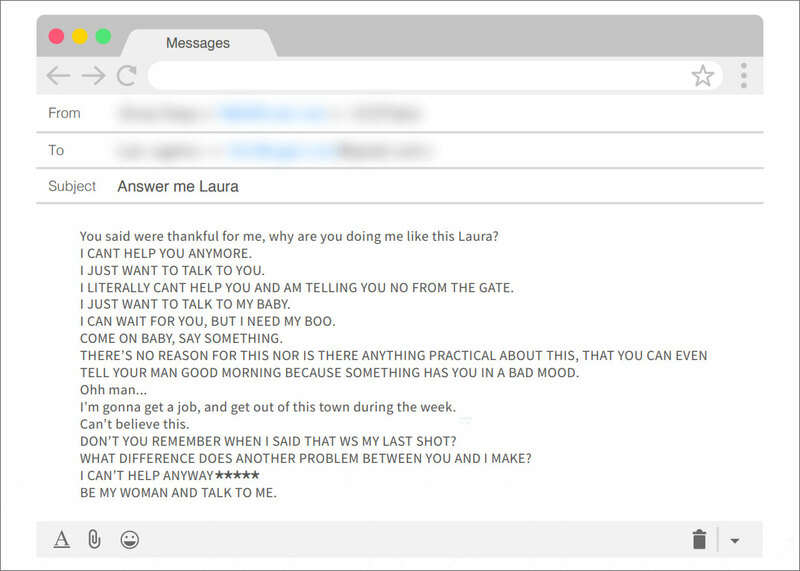 This “relationship” ultimately ended when the scammers stopped replying, but it shows how deeply entrenched victims can get in these fake “relationships”. While this sounds like something that few would fall for, according to Agari it is not that unusual. Unfortunately, protecting yourself from scams like this can be difficult, especially if you are the type of person that they are targeting. That is because lonely people crave love and camaraderie in their life and may miss warning signs. 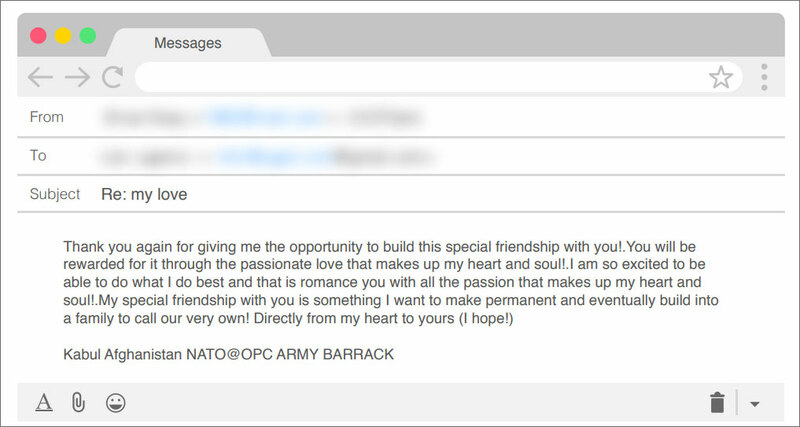 This entry was posted in Uncategorized and tagged computer, email, internet, love, love emails, love letters, online dating, romance, romance scam, scam, tech, technology. This entry was posted in Uncategorized and tagged airline e ticket, airlines, computer, e-tickets, email, hacked airlines, hacking, hacking airlines, internet, tech, technology. 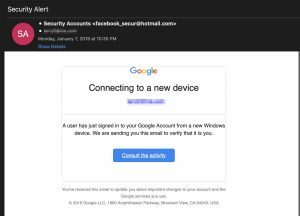 Recently-discovered phishing emails scoop up victims’ Facebook and Google credentials and hides its malicious landing page via a novel method – Google Translate. 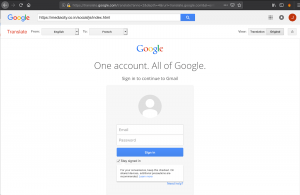 The phishing campaign uses a two-stage attack to target both Google and Facebook usernames and passwords, according to researchers at Akamai who posted a Tuesday analysis. But in a tricky twist of events, the scam also evades detection through burying its landing page in a Google Translate page – meaning that victims sees a legitimate Google domain and are more likely to input their credentials. Cashdollar said that he first noticed the attack on Jan. 7 when an email notification on his phone informed him that his Google account had been accessed from a new Windows device. 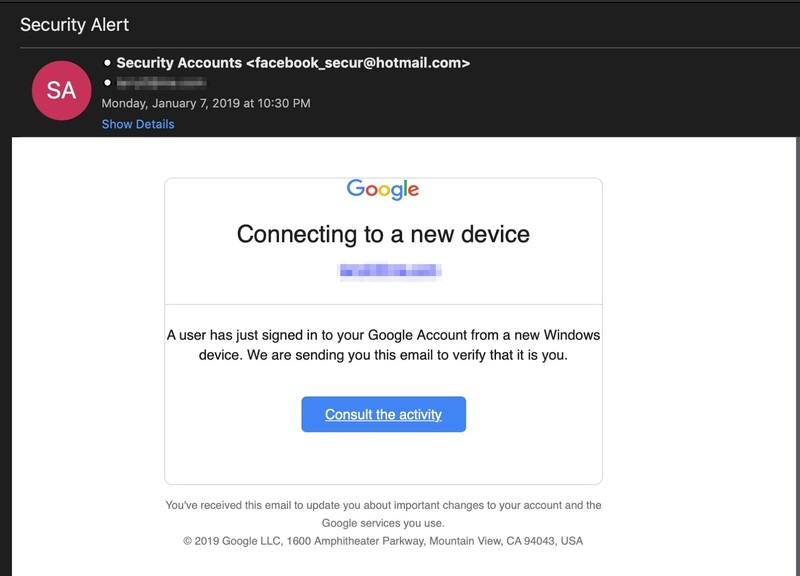 The message, titled “Security Alert,” features an image branded with Google that says “A user has just signed in to your Google Account from a new Windows device. We are sending you this email to verify that it is you.” Then, there’s a “Consult the activity” button below the message. Interestingly, the message looked much more convincing in its condensed state on his mobile device, rather than on a desktop where the title of the email sender is more apparent, he said. That triggered two suspicions: Firstly, the email is from a Hotmail account, raising red flags – but also, the entire address had nothing to do with Google, instead referencing Facebook. When clicking on the “Consult the activity” button, Cashdollar was brought to a landing page that appeared to be a Google domain, prompting him to sign into his Google account. However, one thing stuck out about the landing page – it was loading the malicious domain via Google Translate, Google’s service to help users translate webpages from one language to another. Using Google Translate helps the bad actor hide any malicious attempts through several ways: Most importantly, the victim sees a legitimate Google domain which “in some cases… will help the criminal bypass endpoint defenses,” said Cashdollar. Using Google Translate also means the URL bar is filled with random text. Upon further inspection of that text, victims could see the real, malicious domain, “mediacity,” being translated. Luckily, “while this method of obfuscation might enjoy some success on mobile devices (the landing page is a near-perfect clone of Google’s older login portal), it fails completely when viewed from a computer,” said Cashdollar. For those who fail to notice red flags regarding the landing page, their credentials (username and password) are collected – as well as other information including IP address and browser type – and emailed to the attacker. 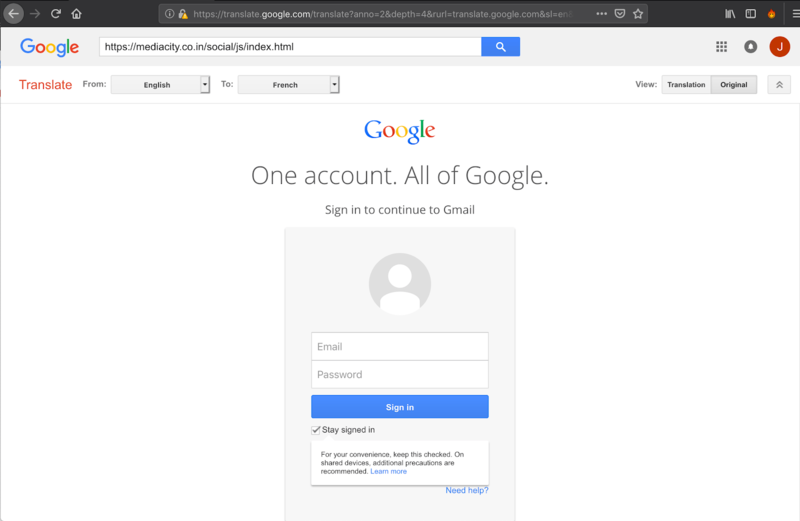 “We are aware of the phishing attempts and have blocked all sites in question, on multiple levels,” a Google spokesperson told Threatpost. The spokesperson urged users to report them if they encounter a phishing site. However, the attack didn’t stop there. The attacker then attempts to hit victims twice, by forwarding them to a different landing page that purports to be Facebook’s mobile login portal as part of the attack. Like the Google page, this Facebook landing page has some red flags. It uses an older version of the Facebook mobile login form, for instance. “This suggests that the kit is old, and likely part of a widely circulated collection of kits commonly sold or traded on various underground forums,” said Cashdollar. 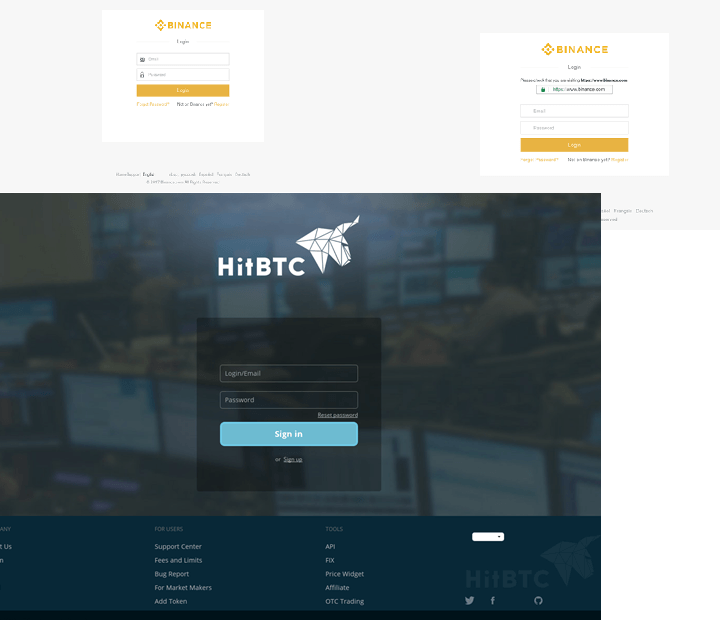 Despite these mistakes, the two stages of the phishing attack suggest a certain level of sophistication on the part of the attacker. “It isn’t every day that you see a phishing attack leverage Google Translate as a means of adding legitimacy and obfuscation on a mobile device. But it’s highly uncommon to see such an attack target two brands in the same session,” he said. Phishing attacks have continued to grow over the past year – and this particular scam is only one example of how bad actors behind the scams are updating their methods to become trickier. According to a recent Proofpoint report, “State of the Phish,” 83 percent of respondents experienced phishing attacks in 2018 – up 5 percent from 2017. That may not come as a surprise, as in the last year phishing has led to several massive hacks – whether it’s hijacking Spotify users’ accounts or large data breaches like the December San Diego Unified School District breach of 500,000. This entry was posted in Uncategorized and tagged attack, email, google, internet, phishing, spam, tech, technology.